In the previous guides we connected the ESP8266 to a local network using hard coded credentials. It is fine for messing around with examples and when developing sketches but not very convenient or practicle for final projects. What happens if you want to move the ESP8266 to another network or if you buy a new router? You need to change the sketch and re-upload. It would be better if we could pick the network to use at run time. This is exactly what WifiManager allows. 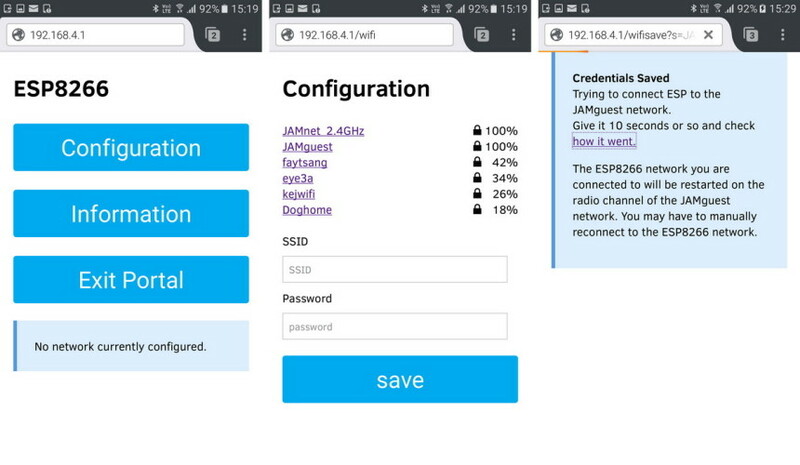 WifiManager is a library that adds a connection page or connection portal to the ESP8266 sketch. This allows the ESP8266 to connect to any local network without the need to hard code the network credentials in to the sketch. 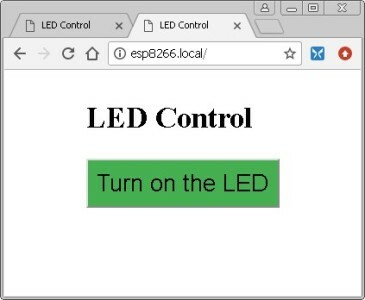 On first use, when using the library, the ESP8266 will start in AP mode and display a small connection/admin page that allows the user to select and connect to a local network. After the user has made a selection the ESP8266 will start Station Mode and try to connect to the selected network. If successful it will show the local network IP address. If the connection fails an error message is displayed. This means once you have connected to a network, you do not need to keep entering the details unless the network changes. When a successful connection is made, the ESP8266 remembers the credentials and tries to connect to the same network next time. If it cannot connect, it uses AP mode to display the connection page again. 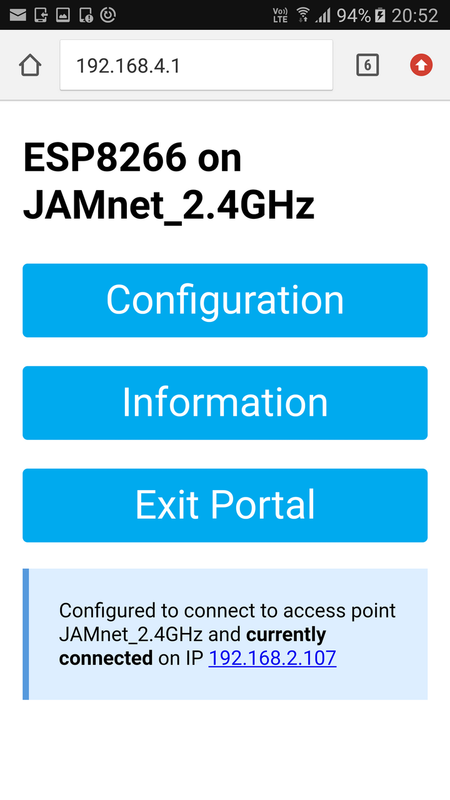 WifiManager uses both Access Point mode and Station Mode together. 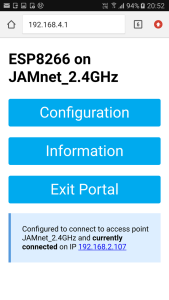 It uses AP mode for the connection page which is available under the ESP8266’s own network and at a known IP address (192.168.4.1) and then uses STA mode to connect to the local network. The WifiManager library was originally released by Tzapu and while this is very good it does have a couple of short comings. 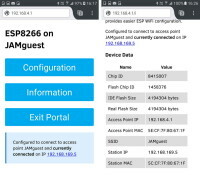 It does not confirm when a connection has been made and it does not give you the new IP address the ESP8266 is using on the local network and of course, we need the IP address if we want to connect to it. Luckily Ken Taylor forked the WifiManager library and addressed these issues and this is the library I am using below. Ken Taylor’s library is here. Ryan Downing offers another variant called PersWiFiManager. At the time of writing Ken Taylor’s library is not available through the Arduino library manger so you need to install the library the old fashioned way; download from Github, unzip and copy the folder to the Library folder inside the Arduino folder. After installing the library restart the IDE and you should have a WifiManager entry under Examples. Open the ConfigOnStartup example. This is a basic sketch to show how things work. the user sketch for the period that the configuration portal is open. can not be read by observers. const int PIN_LED = 2; // D4 on NodeMCU and WeMos. Controls the onboard LED. // initialize the LED digital pin as an output. digitalWrite(PIN_LED, LOW); // turn the LED on by making the voltage LOW to tell us we are in configuration mode. //sets timeout in seconds until configuration portal gets turned off. if (WiFi.SSID()!="") wifiManager.setConfigPortalTimeout(60); //If no access point name has been previously entered disable timeout. digitalWrite(PIN_LED, HIGH); // Turn led off as we are not in configuration mode. // so webserver can not be used again in the sketch. These are included in the ESP8266 core and therefore you should already have them installed. Compile and upload this sketch to the ESP8266. The first time the sketch runs there is no saved network so it will start its own network called what ever name is specified in the startConfigPortal statement. In this case it is “ESP8266″ with a password of “password”. Using a wifi device, scan for networks and you should see ESP8266 listed. Select it and enter the password “password” to connect. Using your web browser of choice, go to 192.168.4.1 and you should get the WifiManger main page. Click the “Configuration” button and you should see a list of available networks. Select one, enter the password and click “save” to connect. After the ESP8266 has connected to the local network the main connection page is updated. You can also click the “Information” link to get additional information. 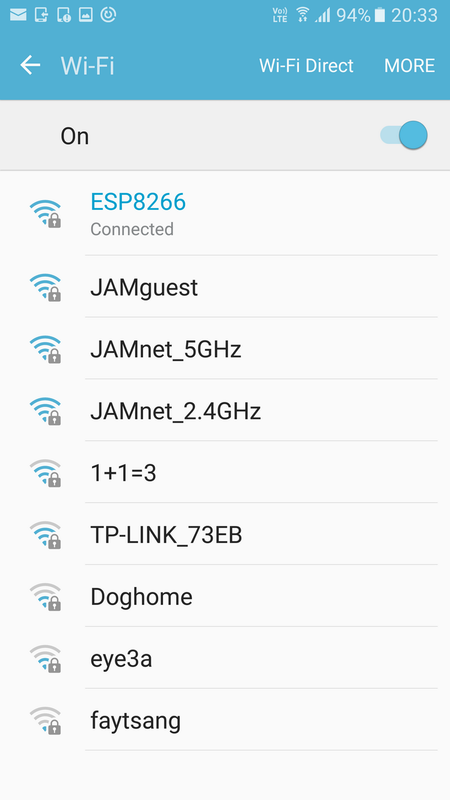 Here I have connected to JAMguest. In use I find the library not quite 100% reliable and have had some connections issues after joining the local network. Sometimes my wifi device (mobile phone) will lose the connection to the ESP8266 and jump back to my home network. However, this is not a big problem since it is a one time operation. After the the network credentials have been entered they are stored and ESP8266 will auto-connect. ConfigOnStartup is the most basic of the examples, other examples include ConfigOnSwitch and ConfigOnDoubleReset. ConfigOnSwitch relies on a switch connected to the ESP8266. When the switch is closed on boot up the configuration page is shown. ConfigOnDoubleReset is a little smarter. This uses resets to determine if the configuration page should be displayed. If the ESp8266 is reset twice within a given time it triggers AP mode and the configuration page. I have commented out rather than deleted the lines that are no longer required. 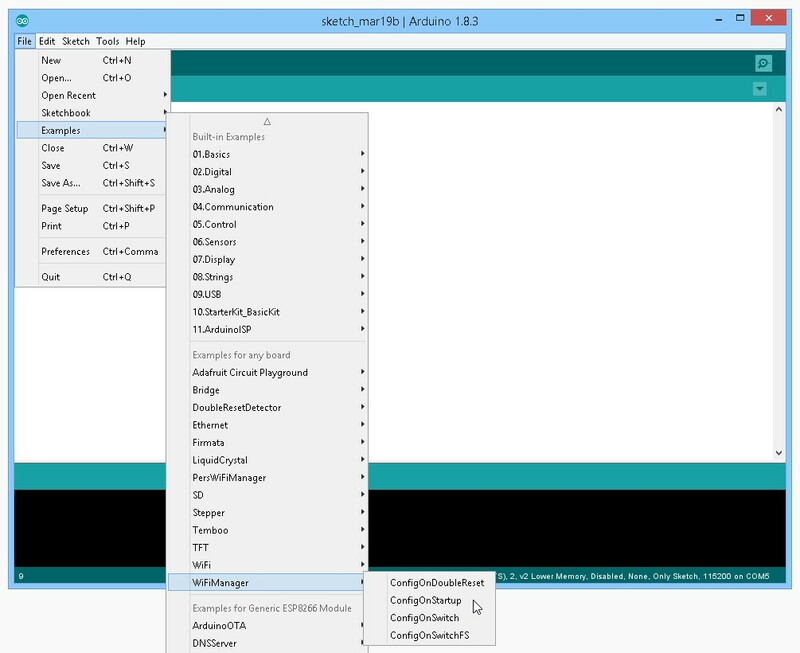 This allows you see exactly what code the wifiManager replaces. Because I already have mDNS, which uses the ESP8266mDNS.h library the DNSServer.h library is not needed and also commented out. Upload the sketch and give it a go. 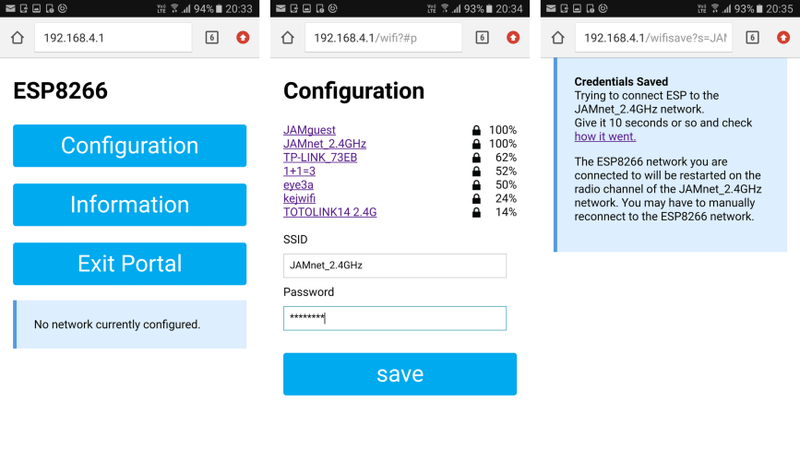 Connect your mobile device to the ESP8266 network. 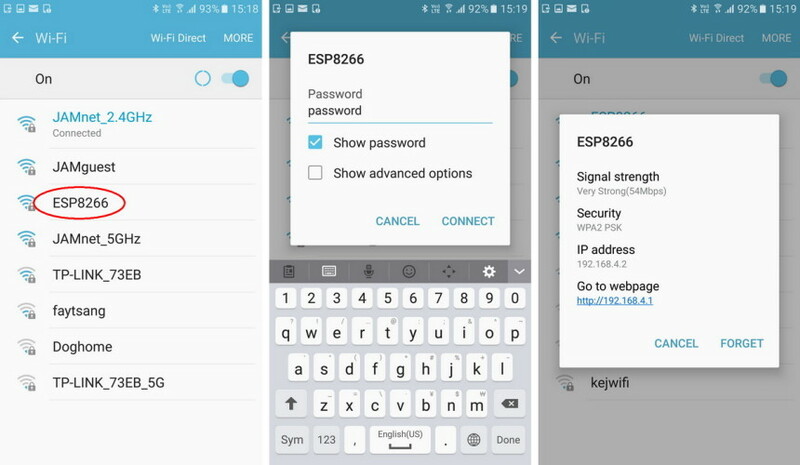 SSID is “ESP8266″ and the password is “password”. After you have connected, open a browser and go to 192.168.4.1. You should see the connection portal. Select your network and enter the password. Wait a few seconds and then cick the link on the final page. If the connection is successful the main page should now show the details for the network. Here you can see the ESP8266 is connected to JAMnet_2.4GHz and has an IP address of 192.168.2.107. 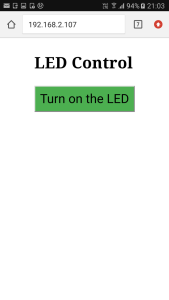 If you now go to 192.168.2.107 you will find you still have the connection portal not the LED control webpage. The portal is still active. To stop the wifiManager portal click “Exit Portal”. When the portal closes so does the ESP8266 AP. Connect to your regular wifi network and try 192.168.2.107 again. 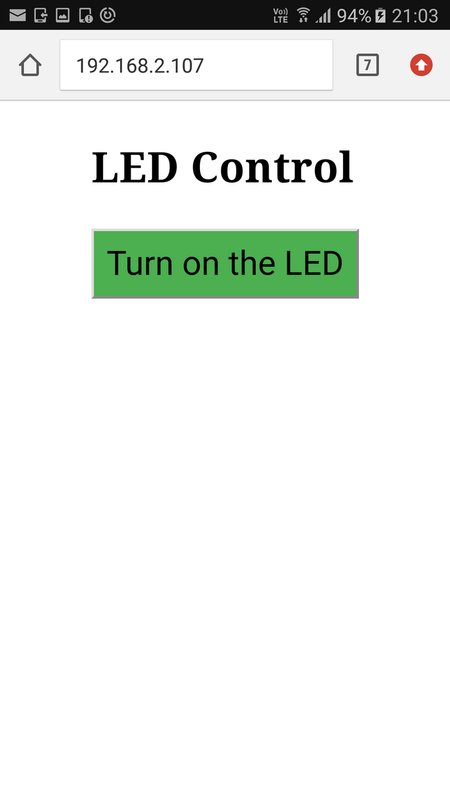 You should not get the LED Control page. Since I am using an Android device I have to use the IP address. On a PC I can use either the IP address or the url esp8266.local. To erase the saved connection details, use resetSettings() just after you initialize the wifimanager library. The Tzapu’s WifiManager is already installed. Can I install the Ken Taylor’s library and use it to overwrite the Tzapu’s WifiManager folder? Or do I need to copy it to another folder? Both libraries have the same name so you can only have one of them at a time. This means you need to delete the Tzapu WifiManager when copying Ken Taylor’s library. Everything is explained very well, and my sketch worked right from the beginning. As I would like to display the found WiFi networks in my own way in my iOS or Android App, not using the predefined Configuration Portal of the WiFi Manager, is there any way to do so? 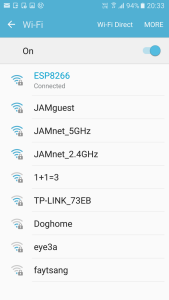 I’d prefer to get the SSID data in JSON format, for example, create my own SSID list etc., and upload the SSID/password back to the library in order to try to connect to the selected router. A scan command is built in but you will need to format the data yourself. Have a look at https://github.com/esp8266/Arduino/blob/master/libraries/ESP8266WiFi/examples/WiFiScan/WiFiScan.ino This is an example of scanning the available networks. with this verson i have to reenter everything eveytime I unplug it. is there a way that this version can retain the settings and all for the wifi and recoonect to the last connection when unplug and back? what do I need to do to make that work?